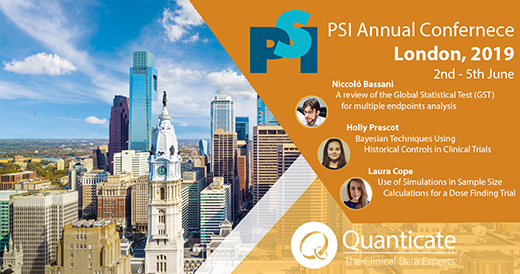 Niccoló Bassani, Principal Statistician I, Holly Prescott, Senior Statistician I, Laura Cope, Statistician II, Matthew Bushell, Head of Internal Recruiting and Valerio Calvanese, Marketing Executive, will be attending at the PSI Annual Conference in London 2nd - 5th June. Niccoló Bassani - A review of the Global Statistical Test (GST) for multiple endpoints analysis. Holly Prescott - Bayesian Techniques Using Historical Controls in Clinical Trials. We are looking forward to meeting you at the conference, schedule a meeting with our team at the show by filling the form at the side.